This is a curated list of things that I like. Things I hope will last a long time and are a joy to use. Some things are old, some are new. Some are for sale for only a short time. Every week I'll add new things to the shop. Happy browsing. 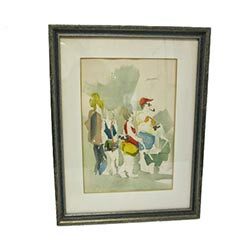 Howard Watercolor, USD$60+: For auction at Housing Works, this watercolor is of people queuing for a bus to the Hamptons. But that's just my imagination. Auction ends on April 17. Molesey Regatta Poster GBP15: "Quite a flotilla of small boats lay moored under the shady side of the island, from which an incessant popping of champagne corks proceeded during the afternoon." A gentleman's report from the Molesey Regatta, 1876. From the London Transport Museum Shop. Lyngseidet Epic Poster, GBP230: Lyngseidet, Norway from the National Martime Museum, taken in 1965. Size is fully customizable and this price is for a 6' (180cm) poster. This is an affordable way to get big art. Worldwide shipping and pricing. From Surface View. Living Large In Small Spaces USD$4-$27: Beds that drop down from the ceiling. Pivting walls that form rooms. It's all in this seminal book on small-space living. It's real people in real homes, from 100 square feet to 1,000. By Marisa Bartolucci. American Modern, USD$36: My favorite interior design book. See my full review here. Thomas O'Brien has a knack for beautifully quiet interiors, with a modern mix of new and old. If you are a fan, also check out Aero, his design firm and shop in Soho. The Visual Display of Quantitative Information, USD$15-$42: This is the seminal book on how to display data in graphs, maps and diagrams. Edward Tufte is a professor at Yale with a considered and opinionated view on this topic, and a cult following. From Amazon or EdwardTufte.com. Dinner Party. Photo by Ann Laurie Valentine. Join a Supper Club: Meet new people among good food and drink at a Supper Club. Supper Clubs are paid-for dining events at private homes. Illegal depending on where you live. The Guardian newspaper tells you how to start your own supper club. Or, join the Secret Dining meetup to find Supper Clubs in NYC. Digital Photography, Intro for Beginners, USD$75: I have never used a DSLR, but I took this course and then started taking photos for this website. The school is called The Art of Intuitive Photography, and the focus is on getting you taking photos, with just enough of the technical info that you need. Speaking with Confidence, USD$545: I took this course with Beverly Thompson at NYU and it changed my life. If you are good at public speaking, then people assume you are good at everything else (which of course, you are). From NYU School of Continuing & Professional Studies. Cabin Pressure, free: Beneditch Cumberbatch is the airline captain in this funny BBC radio 4 extra drama. In every episode they go to a new city, from Abu Dhabi to Yverdon-les-Bains, and all high-jinks ensue. The last episode is Zurich and is yet to be aired, but I, for one, will be sad when MJN air flies for the last time. Redesign my Brain, free: Watch Todd Sampson, a normal, everyday man, learn how to perform three amazing feats (1) memorize a pack of cards (2) complete a successful art installation and (3) escape from locked chains underwater. Mind over matter. From the Australian Broadcasting Corporation, on YouTube. The Entrepreneurs, free: I have just listed to 62 episodes back-to-back. This podcast has engaging interviews with entrepreneurs. From one person baking schools in London to a company making bullet-proof cars in Beirut. It will make you want to strike it out on your own, which is what happened to the original presenter. From Monocle. WaterRower, USD$1,160: Row through actual water on this compact and good-looking machine. From LifeStyle Sports on Amazon. Sahn Helmet, USD$129: I know I need a helmet, but this is the first one that I've wanted. Discovered at Adeline Adeline, a pretty bike shop in Tribeca. Brompton folding bicycle, USD$1,556: Started when Andrew Ritchie designed a folding bike in his flat in South Kensington, London. And it's still made in London. They are famous for their quality, which is important for a bike that folds. From Adeline Adeline. SOLD Hermes HerBag USD$595: This bag is just the right mix of craft and elegance. I have this bag and I love that the body is inter-changeable and the fastening is very clever. From LXR & Co.
Travel case set USD$95: These bags come in many colors and sell out fast. From Cuyana, a new clothing label that started a Lean Closet movement. I'm a big fan. Kenzo belt USD$108: A simple canvas and leather cream belt. From Vaunte, a site that sells items from the closets of fashionable women. This belt is from Liz Goldwyn, writer, director and artist. Vintage Oak Medicine Cabinet, USD$100-$200(est): I love a bit of art deco. I could watch old episodes of Poirot all day just for the set design. This art deco cabinet is for auction on May 3 at Rolands Antiques, NYC. 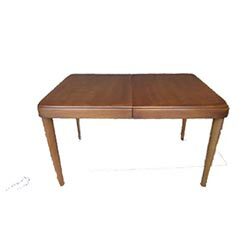 Heywood Wakefield Table, USD$175+: This is the classic Heywood Wakefield dining table, for auction at Housing Works, NYC. In the 1940's the company borrowed from the aesthetic of the French Art Deco, hence the rounded corners. Auction ends April 10, 2014 at 10pm ET. SOLD Bar cart, USD$100-$200(est): a recipe for a cocktail party: a bar cart, three essential spirits, mixers, limes, lemons and 10 friends. This cart is for auction on 5 April at Rolands Antiques, NYC. Heirloom Dishwashing Liquid USD$21: You don't have to hide your dishwashing liquid if it looks this good. From Murchison Hume. Pellegrini's Tea Towel USD$20: Pellegrini's has caffeinated the residents of Melbourne for more than 50 years. It's 60's store front is a local icon, captured here in linen. From ChickenfootDesigns on Etsy. Fabric Extension Cord, USD$39: Elevating the ugly things we have to use, to something we want to use. Thank you School House Electric. 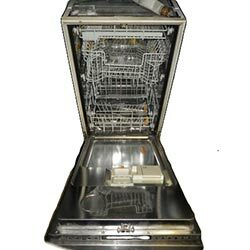 Miele Incognito Dishwasher 18", USD$700: get a slim dishwasher for your teeny NYC apartment. This one is second-hand from Build It Green NYC, a not-for-profit salvage shop that gets items from some of the toniest addresses in the city. Brass Brackets, USD$65 a pair: Found in the handsome and timeless Baltazaar Brasserie, NYC. Comes in three sizes and it's solid brass. From the Hook Lady. Brass Pull USD$98: Rocky Mountain Hardware make high-quality stuff. I have a longer version of this pull for my fridge and dishwasher. Made in tne USA, hand cast and hand finished. From Rustica Hardware. Notebook USD$12: 96 page notebook, made in New Jersey. A dotted grid in the interior pages. 25% of the profits go to teachers at under-privileged schools. From Public Supply. Vintage Telephone Notepad, USD$8: We went from rotary phone to Skpe at an alarming speed. Remember the joys of the big plastic telephone with this notepad from Rifle Paper Co.
Vintage Tiffany Diamond Patterned Pen, USD$50-$100:Tiffany has discontinued this silver pen, but you can still get a vintage one on ebay. Search for Tiffany diamond pen. theSkimm, free: Want someone to tell you the latest news in 1 minute a day? Sign up for a daily email from theSkimm. TheSkimm reads like a short chat from a well-informed girlfriend. Go and read the most recent Skimm on their website. Evernote, free: Keep everything in Evernote, and find it again. See the post on how to use it to file 100 business cards in 15 minutes. Hemingway App, free: This app makes your writing easy to read. Just go to the site and paste in your text. It will highlight in red if the sentence is too complicated, in green if the sentence is in passive voice, and in purple if a word can be simpler. I use it for this blog. Try it. Want your items in the Shop? Then send a link of your item(s) to charlie@workinggirlpress.com. Inclusion on this list is completely free. I just have to really like your stuff.